Global markets breathed a sigh of relief on Monday after this weekend's Syrian airstrikes, with bond yields rising, the dollar lower, Asian and European stocks mixed, and US futures spiking, as investors assessed the prospect of escalating geopolitical tensions after a U.S.-led airstrike on Syria hit only 3 targets - instead of the rumored 8 - and with Russia failing to respond, fears of an imminent military conflict have been sharply ratcheted down, resulting in a generally bullish market reaction. “There was a significant fear of potential escalation; that hasn’t happened so far,” said Callum Henderson, a managing director at Eurasia Group. Even so, “it remains to be seen how long this market rally lasts on the back of this specific factor, whether or not, or when, Russia retaliates,” he said on Bloomberg Television. 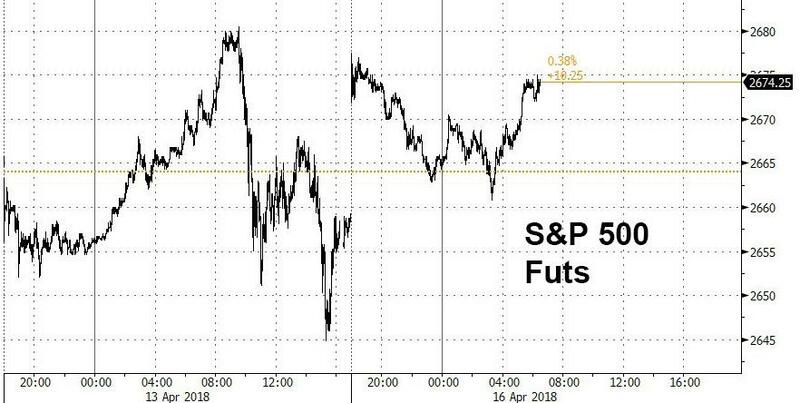 On Saturday, President Donald Trump declared “mission accomplished” on Twitter after 105 Tomahawk cruise missiles struck targets in Syria, further suggesting there would be no immediate escalation, and sending S&P500 futures higher by 0.7%, albeit amid muted volumes. “There is some relief that a direct confrontation between the U.S. and Russia over Syria has been avoided,” said DZ Bank rate strategist Daniel Lenz after Russian President Vladimir Putin warned on Sunday that further Western attacks in Syria would bring chaos to world affairs. Yet while US index futures enjoyed a relief rally, global markets were mostly mixed on Monday, with Hong Kong and Chinese markets sliding led by property taxes amid worries Chinese tightening measures including property tax could hurt home prices. Shares in Sunac China Holdings Ltd. slumped as much as 6.8 percent, China Evergrande lost 5.3 percent, while Shimao Property Holdings Ltd. fell 4.1 percent. The MSCI’s broadest gauge for stocks listed in Asia Pacific fell as much as 0.3%, erasing an early advance, as uncertainty remained over the level of geopolitical risk in the Middle East following the U.S.-led missile strike in Syria over the weekend. In Japan, stocks pared earlier gains with the benchmark Topix index briefly dipping into the negative territory as the yen stages a rebound against the dollar in midday trading in Tokyo. The yen rose 0.1% vs. the dollar to 107.1, after falling by as much as 0.2%, amid rising political risks surrounding Japan Prime Minister Shinzo Abe. Traders are growing concerned the series of scandals plaguing Abe could lead to his early resignation, putting the future of Abenomics, and the BOJ's QE in jeopardy. The approval rating for Abe fell to a record low of 26.7% in a survey by Nippon TV published Sunday. He’s been forced to repeat denials of involvement in scandals as thousands called for his resignation in a protest. “There is the possibility that Japan’s politics will become a catalyst for speculators to build fresh yen longs,” Makoto Noji and Ataru Okumura, strategists at SMBC Nikko Securities Inc., wrote in a note dated Monday, citing the falling approval. European bourses opened the week mixed as investors remain wary of potential escalating tensions regarding Syria. The anticipated US-led response on Syria finally took place on Saturday, which was seen as somewhat of a slap on the wrist as they decided to hit only 3 targets and with the wave of strike action already declared to be over. In terms of sectors, energy is taking a hit from the falling oil prices whilst healthcare names are outperforming with Shire (+0.9%) higher on the day amid reports Takeda Pharmaceutical heads are to meet with US investors ahead of the GBP 35bln bid for the UK-listed pharma name. Furthermore, Shire is to sell their oncology business to unlisted French drugmaker Servier for USD 2.4bln. Whitbread jumped 6.7% after hedge fund Elliot Advisors disclosed its stake in the company, while Shire Plc also rose as it agreed to sell its oncology business to France’s Servier SAS. Elsewhere, the world's biggest ad company, WPP, tumbled -4.4% following the departure of CEO Martin Sorrell after an allegation of personal misconduct, with concerns arising over the future course of action for the company. Meanwhile, amid relief that US-led strikes on Syria looked unlikely to escalate, there were renewed concerns at Russia's potential reaction to new sanctions from Washington. On Sunday, UN Ambassador Nikki Haley, speaking on CBS’s “Face the Nation,” confirmed that US Treasury Secretary Steven Mnuchin would announce new sanctions against Russia today that “go directly to any sort of companies that were dealing with equipment related to Assad and chemical weapons use”. However, so far Russian assets have taken the news in stride, with RUB markets appearing to be more comfortable with the Syria situation - as a result, any further military events should not cause a new wave of risk-off unless we see a direct clash between Russian and US troops, according to various geopolitical pundits. Still, as Citi's FX desk correctly points out, the multi-year trend of worsening US-Russia relations seems to be evolving in a faster pace now. In other weekend news, Trump Economic Adviser Kudlow said he is optimistic US and China can avoid a broader trade spat, while he also confirmed US President Trump wants to look into entering the TPP-11 but that it was too soon to determine how long the process would take. This also comes in the context of a WSJ piece stating that the earliest the U.S. could formally start negotiations to join the TPP is sometime next year, and each of the 11 nations still in the deal have a veto. US Special Counsel Mueller is said to have evidence Trump's lawyer Cohen was in Prague during 2016 Presidential election, which reports state could lend credence to allegations by a former British spy that Cohen met a powerful Kremlin official. Elsewhere, it was also reported that US President Trump is said to have deep concerns on the direction Special Counsel Mueller is taking. Late on Sunday, former FBI Director Comey described the Oval office meeting in which he said President Trump asked him to back off of Michael Flynn which he thinks is certainly some evidence of obstruction of justice. However, he added that he doesn’t think President Trump should be impeached, but instead thinks Trump should be voted out. Moody’s raised Spain’s sovereign rating by one notch to Baa1; outlook stable. Fitch affirmed Luxembourg at ‘AAA’; outlook stable. S&P affirmed Poland at BBB+; outlook revised to positive from stable. European and U.S. government bond yields rose across the board. That was partly as attention turned to what is expected to be a robust first-quarter U.S. corporate earnings season, which begins in earnest this week. The yield on both German and U.S. 10-year government bonds, seen as among the most liquid and safe assets in the world, were at their highest levels in three weeks. In FX, the dollar weakened after futures data showed hedge funds are the most bearish on the greenback in five years. The ruble reversed earlier losses. WTI oil futures dropped sharply, falling toward $66 a barrel amid concern that shale production will rise further, and after there was no immediate reprisal to the missile attack. In terms of energy specific newsflow, OPEC members continue to advocate further cooperation and reiterate that the current supply cuts are to continue to the end of the year. In the metals scope, news arising gold trades slightly softer on an improved risk appetite, and copper is uneventful following Chinese underperformance. Kuwait Oil Minister says June meeting will be a chance to review agreement, but the deal will continue until the end of 2018. Aluminum resumed its rally, adding to its biggest weekly increase on record Friday on concerns about Rusal's future solvency. Economic data include retail sales and Empire manufacturing data, while Bank of America and Netflix are set to report earnings. A slew of Federal Reserve officials who are due to speak, including the incoming head of the New York Fed, John Williams. Donald Trump is “morally unfit” to be president, former FBI Director James Comey said in an interview on ABC News, adding that he couldn’t rule out the possibility that the Russian government has incriminating information about the president. European bourses opened mixed this morning, following suit from the Asia-Pac session as investors remain wary of potential escalating tensions regarding Syria. The anticipated US-led response on Syria finally took place on Saturday, which was seen as somewhat of a slap on the wrist as they decided to hit only 3 targets and with the wave of strike action already declared to be over. In terms of sectors, energy is taking a hit from the falling oil prices whilst healthcare names are outperforming with Shire (+0.9%) higher on the day amid reports Takeda Pharmaceutical heads are to meet with US investors ahead of the GBP 35bln bid for the UK-listed pharma name. Furthermore, Shire is to sell their oncology business to unlisted French drugmaker Servier for USD 2.4bln. Whitbread (+6.7%) is dominating the FTSE 100 after reports Elliott Advisors is pressuring the company to spin-off Costa in an effort to generate as much as GBP 3bln of additional value. Elsewhere, WPP (-4.4%) following the departure of CEO Martin Sorrell after an allegation of personal misconduct, with concerns arising over the future course of action for the company. London House Prices Fall in Stark Division With Rest of U.K.
Asian stocks traded with a mixed tone as focus centred on air strikes on Syria over the weekend and Chinese data. The anticipated US-led response on Syria finally took place on Saturday, which was seen as somewhat of a slap on the wrist as they decided to hit only 3 targets and with the wave of strike action already declared to be over. As such, US equity futures gapped higher at the open, while ASX 200 (+0.2%) and Nikkei 225 (+0.3%) were also in the green as fears of an escalation subsided. Conversely, Shanghai Comp. (-1.5%) and Hang Seng (-1.6%) were negative following the miss on Chinese lending data last week and with tomorrow’s Chinese GDP adding to the risk factors, while the PBoC also announced to raise the 14-day reverse repo rate by 5bps which was in-line with the hikes seen in money market rates in reaction to the March Fed hike. This saw an increase in money market rates in Hong Kong, while underperformance was led by Rusal shares which tumbled over 20% after US announced to impose further Russian sanctions. Finally, 10yr JGBs are uneventful amid a subdued tone in USTs and indecisive risk sentiment in the region, while the absence of a BoJ Rinban announcement also ensured quiet trade. Finally, 10yr JGBs were uneventful and traded little changed amid the mixed risk tone and as a lack of BoJ Rinban announcement also ensured quiet trade. In currencies, the Dollar index has faded after brief attempt higher within a 89.850-600 range, and the Greenback is now softer for choice vs all G10 counterparts, albeit modestly. Moreover, the ‘reaction’ to Saturday’s US-led strikes against Syria has been relatively tame overall, with the targeted military action appeasing fears over more aggression and potential retaliation. EUR/GBP: Outperformers, as Eur/Usd firms above the 1.2300 handle, 10 DMA at 1.2310 and 55 DMA at 1.2327, but falls just short of a key Fib at 1.2377 having failed to seriously test 1.2400 on several occasions of late. Cable remains underpinned and just posted a session high above 1.4300 (best since the YTD high of 1.4345), and perhaps buoyed by a Eur/Gbp sell recommendation from a big US bank eying 0.8475 vs a circa 0.8645 low/0.8670 high. JPY/CHF/NZD/CAD/AUD: All essentially flat vs the Usd, around 107.20, 0.9600, 0.7355 and 1.2600 respectively and awaiting further impetus. Dovish BoJ commentary has weighed on the Jpy, and similarly soft Swiss producer prices for the Franc, while the Loonie is looking for independent direction from the BoC on Wednesday and Canadian CPI on Friday. Aud/Usd is holding towards the upper end of a 0.7785-50 band, but also capped ahead of the nearest big figure after topping out just above last week. USD/RUB: The Rouble is under pressure again amidst 62.0000-63.1500 parameters vs the Dollar ahead of latest reciprocal sanctions from the US and Russia, as the latter pledges to respond forcefully, and also warning that further strikes vs Syria will not be tolerated. In commodities, WTI and Brent futures trade lower amid an unwind of the geopolitical premium and another uptick in the Baker Hughes rig count on Friday. The unwind in risk comes following the Syrian strikes on Saturday which were not as wide-reaching as some had feared. This risk-on attitude is tempered, however, as markets await further action surrounding Russian sanctions and retaliatory effects. In terms of energy specific newsflow, OPEC members continue to advocate further cooperation and reiterate that the current supply cuts are to continue to the end of the year. In the metals scope, news arising gold trades slightly softer on an improved risk appetite, and copper is uneventful following Chinese underperformance. Kuwait Oil Minister says June meeting will be a chance to review agreement, but the deal will continue until the end of 2018. The temperature has certainly been raised on the geo-political front this weekend with Friday night’s 105 ‘targeted’ missile strikes on Syrian chemical weapons facilities, which had set their program “back for years”. President Trump tweeted “mission accomplished” while the UK Foreign Secretary Johnson noted there was “no proposal on the table” for further strikes, which is consistent with comments from US defence secretary Mattis. Elsewhere, Russia’s President Putin noted that further Western attacks on Syria would “inevitably lead to chaos in international relations”. On Sunday, the UN ambassador Haley said that the US will announce new sanctions today on Russian firms that “go directly to….dealing with equipment” related to the Syrian leader and his chemical weapons. 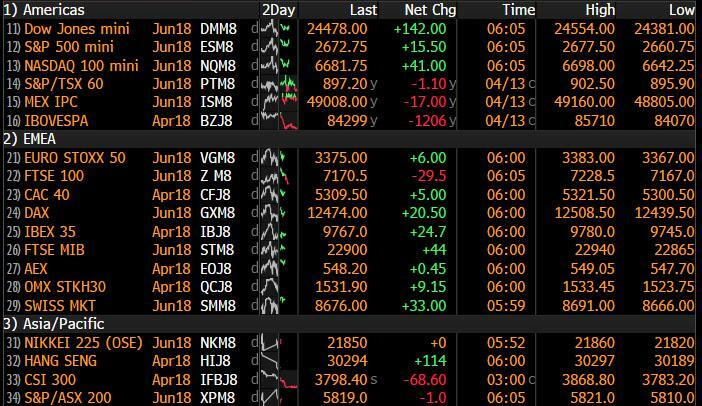 This morning in Asia, markets are trading mixed with the Nikkei (+0.26%) and ASX 200 (+0.24%) modestly up while the Kospi (-0.03%), Hang Seng (-1.55%) and Shanghai Comp. (-1.32%) are down as we type. Elsewhere, futures on the S&P are up c0.4% while the Yen is c0.1% stronger. In Japan, the latest poll from Nippon TV showed PM Abe’s approval rating has fallen to the lowest level since late 2012 (26.7%). In the US, the latest poll by ABC news showed President Trump’s approval rating has risen to the highest in 2018 to 40% (vs. 36% in Jan.). As for this week it’s hard to look beyond geopolitics and trade war developments. On the former the market hope is that the fact that the Syrian air strikes were targeted and that Russia haven’t further inflamed the rhetoric so far, means that we can slowly move on. The latter is still bubbling around the surface and it was interesting that Friday saw a WSJ article suggesting a possible White House announcement about which products are on the list of $100bn of Chinese goods subject to tariffs comes to fruition this week. Elsewhere there are still some notable data to highlight including China Q1 GDP (tomorrow) and US retail sales (today). The Fedspeak diary is also packed full all week while President Trump is due to meet Japan's Abe, the IMF/World Bank Spring Meetings kick off, and Germany's Merkel and France's Macron meet to discuss EU reform and trade. In addition to all that, US earnings season steps up with 61 S&P 500 companies due to report. The full week ahead is included at the end. As a prelude to this week’s Fed speak, the Fed’s Rosengren noted “we have to be vigilant to make sure we’re not over stimulating the economy and generating either wage and price increases that are faster than what we’re going to want in the long run”. He expects the unemployment rate will decline to 3.7% this year and “it’s possible that (it) will fall even more rapidly in the short term”. On rates, he “expects somewhat more tightening may end up being needed” than the current Fed dot plot projections of three rate hikes for 2018 (ie: 2 more) while “inflation is likely to increase a bit more than the current median forecasts” by the Fed. Following on, our Chief international economist Torsten Slok noted that in the history of economics, it has never happened in any country anywhere in the world that inflation has hit the target and stayed at exactly that level for 12 months. Hence, the risk of an inflation overshoot is rising, and as a result, the belly and the long end of the curve will move higher, finally recognizing that the Fed is right and that higher rates are needed across the curve to cool down inflation and the economy. Now recapping market performance from Friday. In equities, the Stoxx 600 rose +0.10% while the S&P 500 fell -0.29% with losses led by the financials sector. While US banks’ 1Q results were broadly above market expectations, the share price for JPM and Wells Fargo both fell -2.7% and -3.4% respectively, in part as JP Morgan’s CEO Dimon noted competition is intense and lending was flat for the quarter while WFC noted a potential $1bln charge to settle with the US consumer regulator. The VIX fell for the fourth consecutive day to 17.41 (-5.84%). Government bonds have firmed slightly with core 10y bond yields down 0.5-2bp (UST -0.9bp; Bunds -0.4bp; Gilts -2.1bp). Key currencies were marginally higher, with the US dollar index up 0.04% while the Euro and Sterling also advanced 0.03% and 0.07% respectively. In commodities, WTI oil rose for the fifth straight day to be up 8.59% last week to $67.39/bbl. Precious metals gained c1% (Gold +0.84%; Silver +1.14%) while other base metals were little changed (Copper -0.06%; Zinc +0.15%; Aluminium +0.21%). Away from the markets and onto some weekend headlines. In France, President Macron spoke with BFM TV to highlight his desire for “deep reform” of the local tax system to divide it up between cities, departments and regions. However, he added no new taxes are planned, including local taxes during his mandate. In the UK, the Telegraph reported that the BOE has privately warned banks that the end of its £127bn cheaper term funding scheme posed a “systemic risk” to the British financial system. Over at the Americas Summit in Lima, the US VP Pence noted he is “…hopeful that we are very close to a renegotiated NAFTA and there is a real possibility that we could arrive at an agreement within the next several weeks”. Elsewhere, the Canadian PM Trudeau spoke of “positive momentum” and would like to “see a renegotiated deal sooner rather than later”. Before we take a look at today’s calendar, we wrap up with other data releases from Friday. In the US, the April University of Michigan consumer sentiment index fell 3.6pts from last month’s cycle high to 97.8 (vs. 100.3 expected). The survey indicated inflation expectations for 1 yr and 5-10yr both eased 10bp mom to 2.7% and 2.4% respectively. The February JOLTS job openings was slightly above market at 6,052 (vs. 6,024 expected) with the quits rate steady at 2.2%. Elsewhere, the NY Fed’s estimate of 1Q GDP growth was unchanged at 2.8%. In Europe, the final reading for Germany and Spain’s March CPI was unrevised at 1.5% yoy and 1.3% yoy respectively. The Euro area’s February trade surplus was slightly above expectations at €21bln (vs. €20.2bln). The big release to kick the week off comes in the US with the March retail sales report. Other data due in the US includes the April empire manufacturing print, February business inventories and April NAHB housing market index reading. There is no data due out in Europe or Asia. Away from the data the Fed's Bostic is due to speak in the evening. EU foreign ministers are also due to meet to discuss the situation in Syria. Bank of America and Netflix are the earnings highlights.